A routine that sets the stage for deep inquiry. 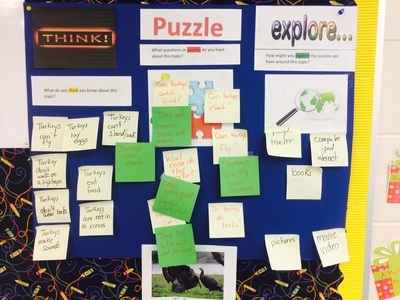 Description: The Think-Puzzle-Explore thinking routine is more inquiry-based than the popular fact-generated KWL. In order for the use of this routine to be most effective, the teacher's language plays a vital role in initiating student responses. Refer to pages 71-77 in the book Making Thinking Visible: How to Promote Engagement, Understanding, and Independence for All Learners. Usually used at the beginning of a unit, but also effective at the conclusion of a unit.